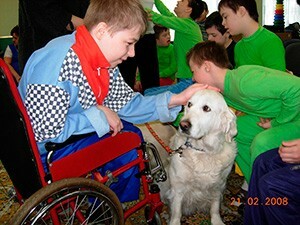 Therapy dogs help orphaned children. Support a good deed! The goal of the project is rehabilitation and improvement of the quality of lives for orphans with severe mental disorders with the help of canine therapy. 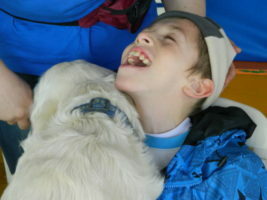 For more than 10 years together with the Sunny Dog Project led by an independent nonprofit organization Dogs As Assistants Training Center we organize canine therapy* activities for children and young people with severe and complex developmental disorders. improvement of sociability – they are easier to get in contact with, both with adults and with each other, which is very rare for children with developmental disorders. 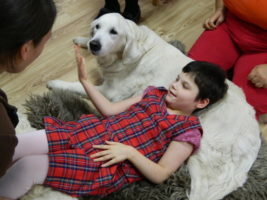 Some of the children show especially vivid results – you can learn more about it in the project presentation (link to the presentation) and from reports about activities (link to the archive of news about canine therapy). We pay for the experts work. The activities are held 2 times a month in average. Every time the activity lasts for 2.5 hours. Sometimes all children are involved together (groups of up to 12 people), and with some of the children individual work is performed. Overall, more than 65 children already took part in the activities. – improvement of sociability – they are easier to get in contact with, both with adults and with each other, which is very rare for children with developmental disorders. 500 rubles – approximate cost of 1 class for 1 child in an orphanage. 2,800 rubles – approximate cost of 1 class with a group of children in an orphanage. 7,000 rubles – approximate cost of 2.5 hours’ class with a group of children in an orphanage. Budget of the project for 9 months is 137,000 rubles. Helping is easy and joyful! Let’s do it together! 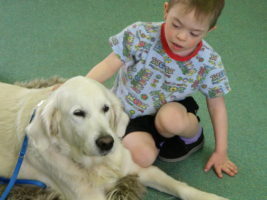 * Canine Therapy (dog-assisted therapy) is one of the main kinds of treatment and rehabilitation of a person with the help of specially trained dogs and under supervision of qualified canine therapists. This is a psychotherapeutic methodology which fosters the development of mental and emotional capabilities, improvement of movement functions and motility. This method also can be used to increase the effect of personality development during correction, rehabilitiation and social adaptation of children with special needs.